Rain at this time of year can cost an arable farmer tens of thousands of pounds. Why? Because he’s going to have to secure the services of a giant hairdryer. Wheat and barley can only be sold and stored if it is above a certain level of dryness. So if it rains around harvest time, the grain gets wet and the farmer has to pay to have it dried. This can cost, depending on the weight, around £15,000. Not to mention the additional carbon cost for the environment. At this time of year the farmer is playing a delicate game – he needs to harvest before the crop is past its best and starts to rot in the field, but ideally he also needs to do it during a dry spell. This year that’s been a tough call. Fortunately though, for the farmer, the price of wheat is relatively high (around £150 per tonne) so he can absorb some of the extra costs. In years when the price is lower, it’s much harder and the drying process may wipe out the profits. Whether you are a commercial arable farmer or an amateur with a passion for growing-your-own you’ll face a similar challenge – almost everything is ready to harvest at the same time and you end up with a glut! The challenge is prolonging the life of this food in order to take us through the winter. Nowadays it’s not something we think about – a wide variety of food is available all year round in the supermarkets. But if you grow your own it brings this problem of storage and preservation into sharp focus. In the space of one weekend I harvested 6lbs of blackberries from my back garden, the following weekend I collected 12lbs of windfall pears and another 10lbs of apples. What do I do with them all? How can I preserve my crop and reap the benefits of home grown produce, long after the autumn leaves have turned to a frosted mulch? Many fruits and vegetables can be frozen. Its best to freeze them as soon after harvesting as possible – as this will retain the flavour. Think first about what you may want to use them for later as this will dictate the best way to freeze them. For example; I peel, core and slice apples and freeze them without cooking. This way I can use them in apple strudel (one of my favourites) or stew them later for a crumble. It gives me options. Alternatively make larger quantities of the dishes you love and freeze the ready-made meal. It’s so much healthier (and tastier) than the supermarket version and a great way to use up an excess of vegetables. Some produce lends itself to home drying. For example mushrooms can be dried, also chestnuts and even apples. They can be dried in an airing cupboard (but it takes up a lot of space and quite a long time) or you can buy a dehydrator. This is quicker and far more controllable. Its best to choose a dry day – if it’s raining or the air is very damp then the drying can take ages and in some cases you’ll never really get the food as dry as it needs to be. These are traditional storage methods and in many countries they are still a very popular way of ensuring the family has enough food through the winter. A friend’s mother in Bulgaria spends the autumn busily bottling and preserving almost anything she can lay her hands on! Chutneys are a good way to use up soft vegetables like marrows, pumpkins and tomatoes. Almost anything goes – so use your imagination; add chillis, or crystallised ginger, or some apple. There are very few rules. The chutney will last for years and just gets better with age! Pickling is generally thought of in relation to onions, but you can also pickle cucumbers, walnuts, tomatoes, pears – in fact almost anything you can grow can be pickled. There is evidence that we have been pickling since 2030BC! 4000 years of history can’t be wrong. Generally the produce is blanched first, packed into the jar and then the vinegar is added. You can adjust the flavour by adding herbs and spices like bay leaves and peppercorns. Bottling (or canning if you have the correct kit) is an easy way to preserve a wide variety of fruits. Fruit can be bottled raw, with a sugar syrup, or it can be pureed and then bottled. Remember it’s important to sterilise the jars thoroughly. Preserves and Jams are generally very easy and keep for a few years if unopened. Essentially you cook the fruit, add a lot of sugar and some additional flavours – like lemon zest or cinnamon. My personal favourite is my Grandmother’s recipe for Pear Preserve. It’s easy and takes less than an hour (once you’ve prepared the pears). It keeps for years and tastes great as a spread, but even better in an upside down pudding – spoon a thick layer into an oven proof dish and pour a sponge mix on top. Bake in the oven until the sponge mix is cooked and golden brown in colour. Serve hot with cold cream – delicious. Many fruits and vegetables can be stored without the need for freezing, pickling or drying. Generally storing falls into three different categories. 3. those needing cool (10 degrees Celsius) dry storage [e.g. hot peppers, pumpkins, squash, and sweet potatoes]. You’ll need to divide the produce and ensure it is kept in the correct conditions. For cold moist conditions you may find a fridge will do the trick, or even a cool shed. For dry conditions its probably better to use a spare room in the house as this is less likely to suffer from damp. In some cases, e.g. Jerusalem Artichokes I store them where they are – in the ground. They are ready to harvest now, but I leave them there and only dig them up over the winter as I need them. You lose a few to the creepy crawlies in the soil, but it saves so much time and effort I think it’s worth it. So whether it’s a glut from your garden or a special offer at the market – there are plenty of ways to keep your food tasty and available, deep into the winter months. 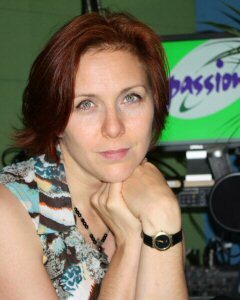 Chantal Cooke is a professional journalist and co-founder of PASSION for the PLANET radio. You can listen via DAB or online at http://www.passionfortheplanet.com or visit http://www.passionforfreshideas.com for hundreds of podcasts to help you live a green and ethical life.